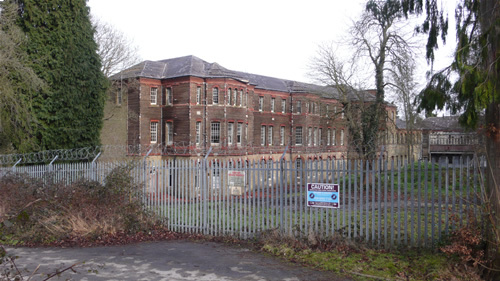 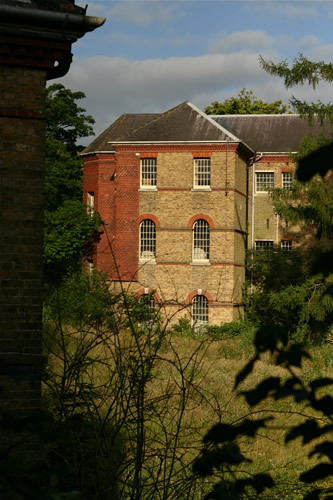 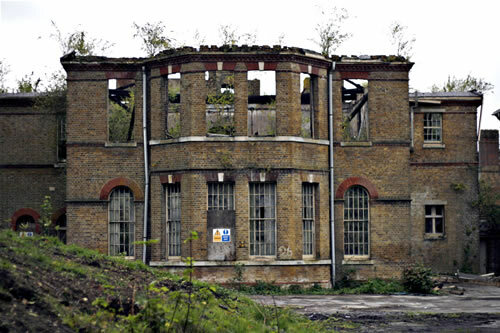 Immediately prior to demolition, Cane Hill was in a hugely varied state. 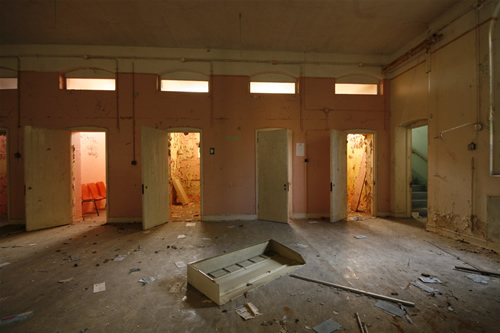 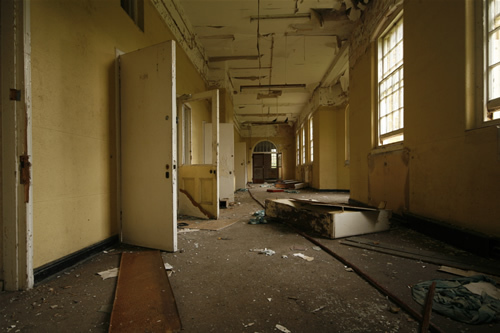 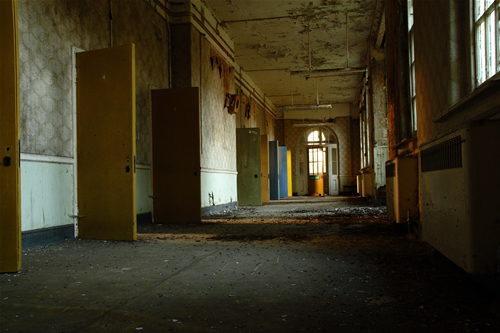 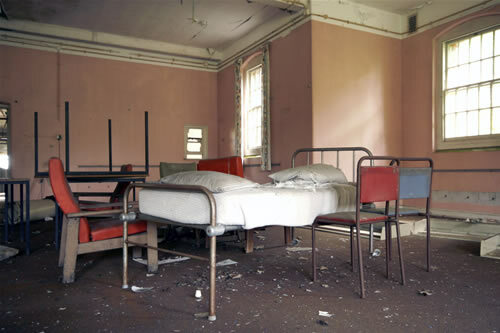 Several wards were crumbling; two had been destroyed by fire, some had decay evident but were otherwise stable, and other parts of the hospital were in a precarious state. 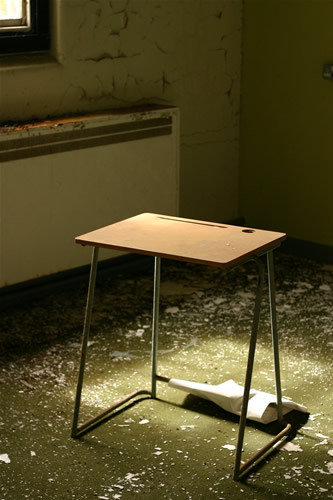 Various items remain, including journals, items of furniture and wall decorations. 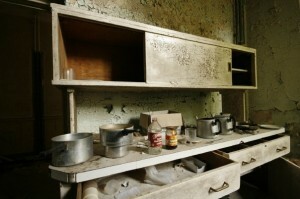 Some metal wardrobes/cabinets have been topped. 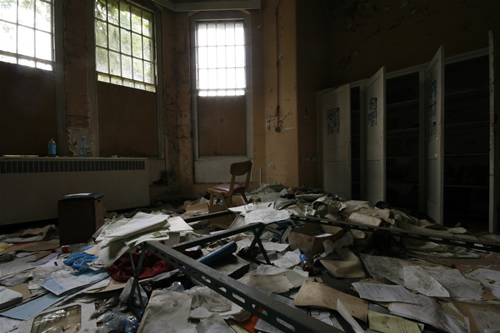 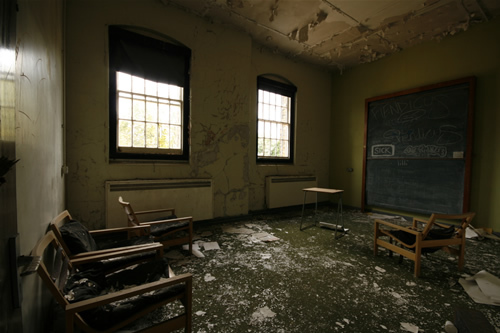 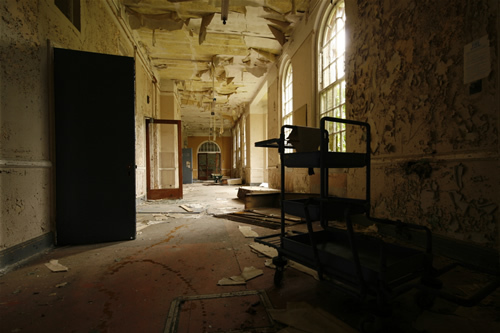 The ward has otherwise been cleared, and has suffered no notable vandalism or arson. 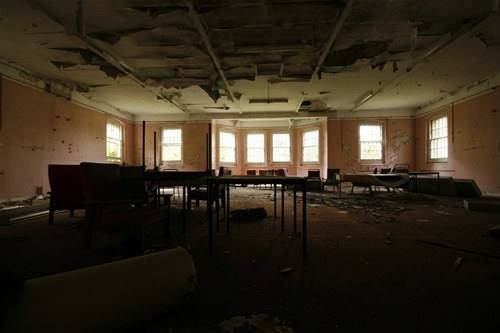 Destroyed by fire around 2002, C block was a burnt out shell when I visited. 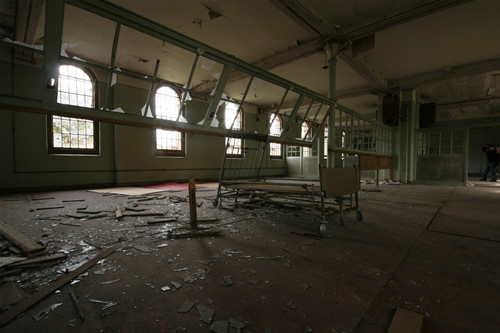 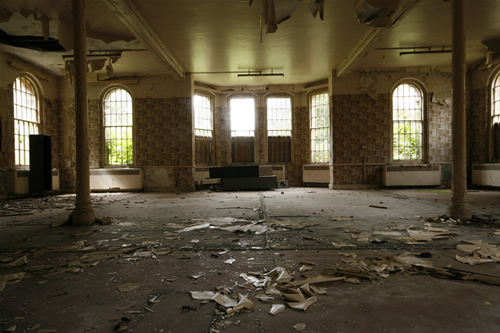 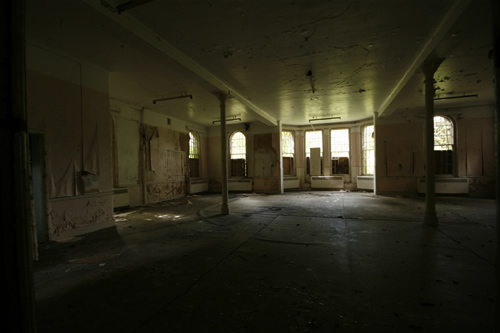 This ward was rather crumbly, with pigeons haven taken up residence on the top floor. 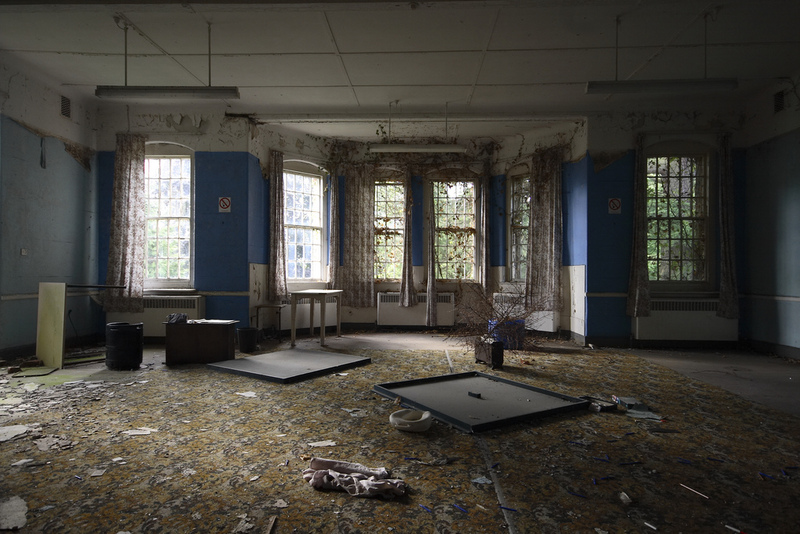 There were various items left lying around, including a monopoly board. 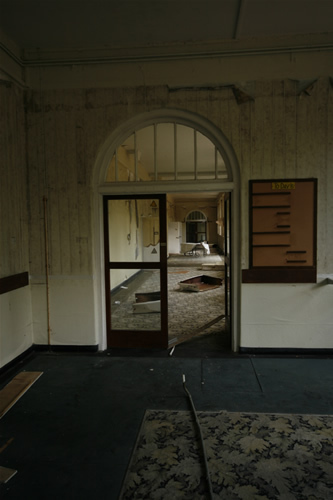 Several signs were left in situ, including the television room. 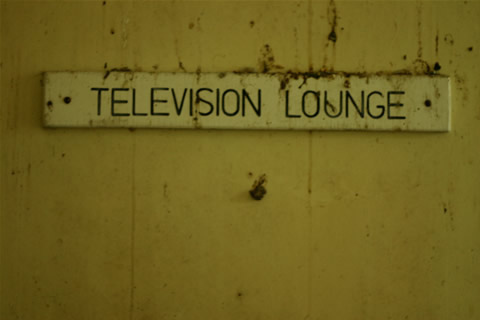 Television lounge sign, a bed remains in situ. 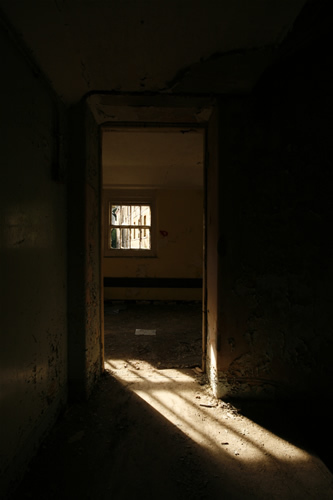 Ellis is a dark ward, boards set against the groundfloor windows to deter intruders. 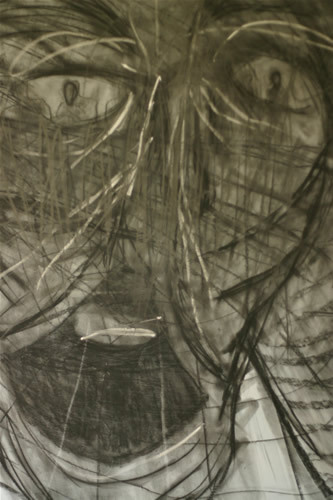 Guy ward was in a similar state to Ellis, dark and moody. 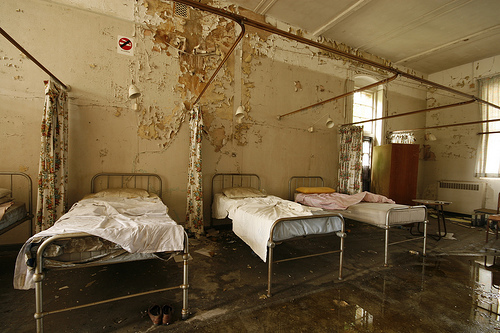 There are lots of beds scattered about on the first floor. 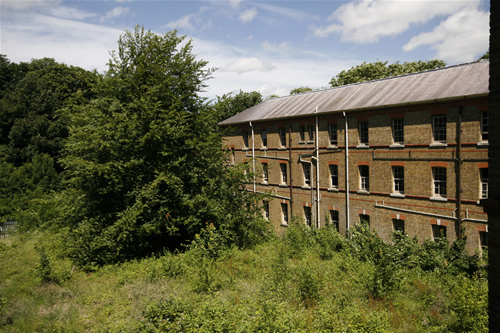 This building is in a better condition than H Block, built to the same design. 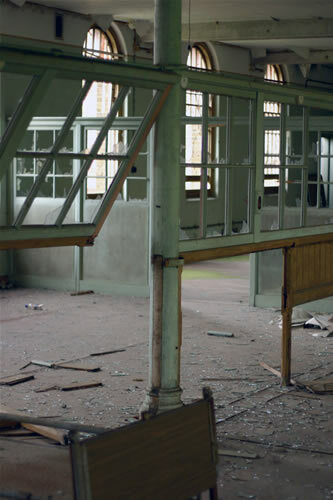 The ground floor has rotten floors, but the middle and top floors are sturdy and dry. 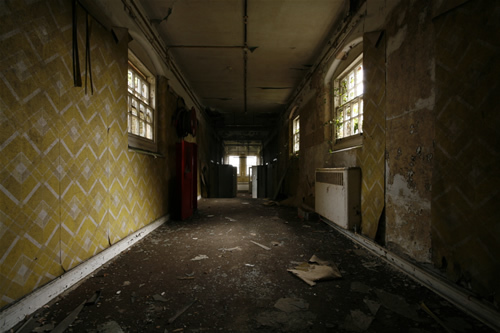 At the rear of the Hospital was the domestic’s block, accomodation for the cleaners and kitchen staff. 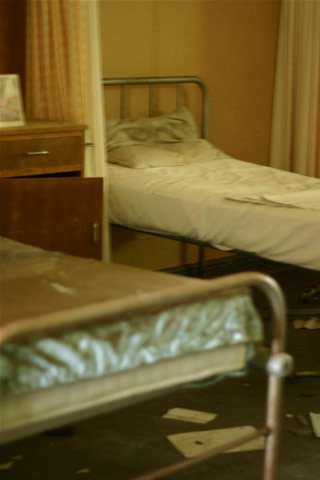 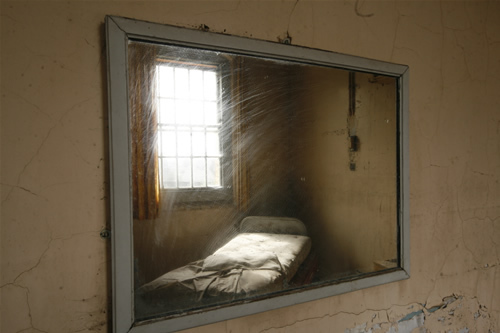 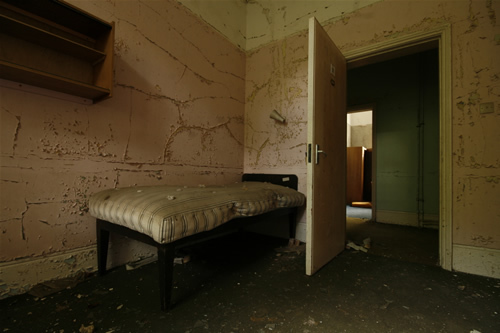 This was condemned in the 1970s, and although several beds remain, the block is in a sorry condition. 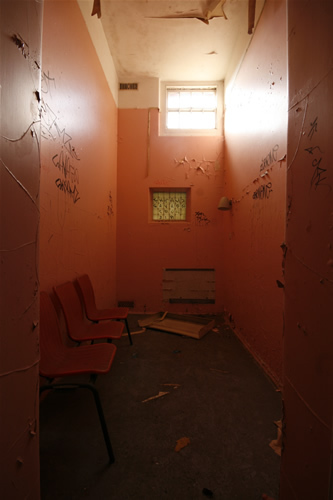 There is grafitti in parts. 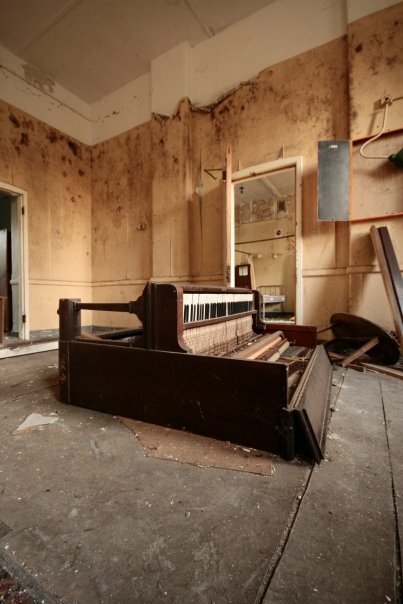 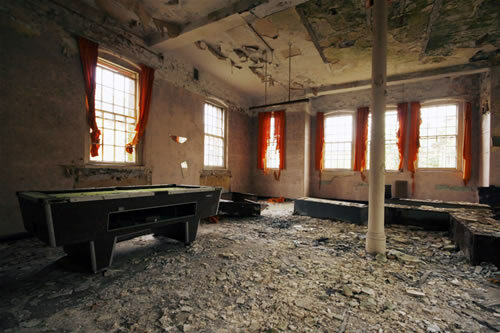 Notable for the presence of a pool table on the first floor and a baby grand piano on the ground floor, L block is in poor condition, starting with the collapsed floor at the entrance. 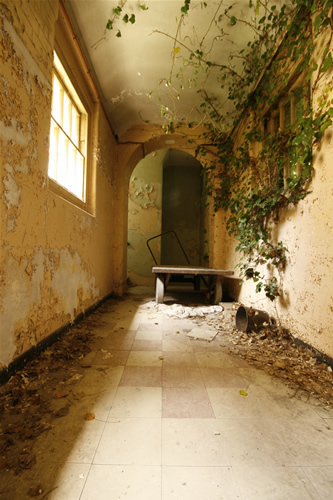 Baths remain in situ, and the presence of much natural decay suggests it was a rather early closure. 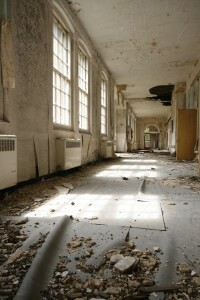 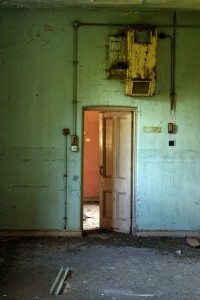 I did not gain access to Mapother ward, due to it being amongst the first to be demolished. 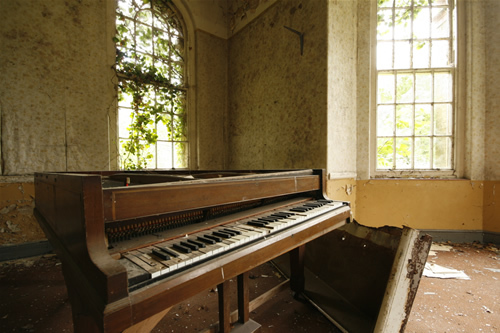 I believe there to have been several items left in situ. 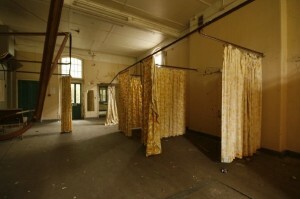 This is the last ward on the Female side, the remaining were on the Male side, which closed first.